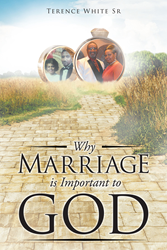 Recent release “Why Marriage is Important to God” from Page Publishing author Terence White Sr. is about how if spouses are willing to study the word of God with a true heart for knowledge and instruction, the author would most assuredly guide them to the things required for their situation and prepare them to be an example to others. Terence White Sr., a devoted husband, former business owner, and church founder, has completed his new book “Why Marriage is Important to God”: an inspiring book about the best toolbox ever put together, the Word of God. Published by New York City-based Page Publishing, Terence White Sr.’s motivational writings detail his common-sense approach but require humility to grow in understanding and implementation of God’s wisdom. White has tried over the years to help couples from every walk of life realize the importance of acknowledging that they cannot meet the demands of governing a marriage in joy and effectively raising a family without the great author and finisher of faith. The author has known couples who ignored this advice and rejected the tools made available by God, and their marriages did not last, or they were most miserable and all manner of discord was brought into their institution. The result was bitterness, infidelity, and no peace, and eventually it was destroyed. White has also known couples that have navigated the waters of life in their institution for well over sixty years, and took the time to find the wisdom of God in using the tools he provided in raising their families and obtaining peace. White seeks to encourage readers to change the course of their marriage and recover the joys they shared when they first realized their love for each other. Couples must set aside the destructiveness of pride and arrogance, and pursue the knowledge, understanding, and the wisdom of God in Christ Jesus. Readers who wish to experience this inspiring work can purchase“Why Marriage is Important to God” at bookstores everywhere, or online at the Apple iTunes store, Amazon, Google Play or Barnes and Noble.